On Friday, September 23, 2011, former Luzerne County President Judge Michael T. Conahan, 59, was sentenced by Federal Middle District Court Judge Edwin M. Kosik to 210 months, or 17.5 years, in federal prison for his part in the Luzerne County judicial scandal. 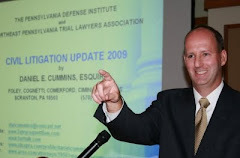 Conahan pled guilty to his crimes and received a sentence of almost 10 years less than co-Defendant, former Luzerne County Judge Mark A. Ciavarella. Before the sentence was handed down, Conahan sat as he read a prepared statement accepting responsibility for his actions and apologizing to all of those he harmed. He told the court, "...the system was not corrupt. I was corrupt."